CHICAGO — Speaking out for banned and challenged books is vital in the fight against censorship. This Banned Books Week (Sept. 23-29), readers are encouraged to raise their voices in support of the freedom to read by participating in engaging activities. Information on local Banned Books Week events can be found on the Banned Books Week Coalition Calendar. Learn more about how to get involved with Banned Books Week at the Facebook Live event “6 Ways to Express Your Inner Activist for Banned Books Week” at noon Central on Monday, Sept. 17. The Dear Banned Author letter-writing campaign encourages readers to write to, tweet or email banned or challenged authors, sharing how their stories have impacted lives. Dear Banned Author not only raises awareness of books that are threatened with censorship, but also generates discussions about the essential access to a variety of library materials. Authors have also shared fan letters as support when there's a public challenge to their books. Readers are invited to share their stories online and join the conversation using the hashtags #DearBannedAuthor and #BannedBooksWeek. Libraries are also invited to host letter-writing programs during Banned Books Week. Promotional tools, printable postcards and a list of banned and challenged author addresses can be found ala.org/advocacy/bbooks/dear-banned-author. 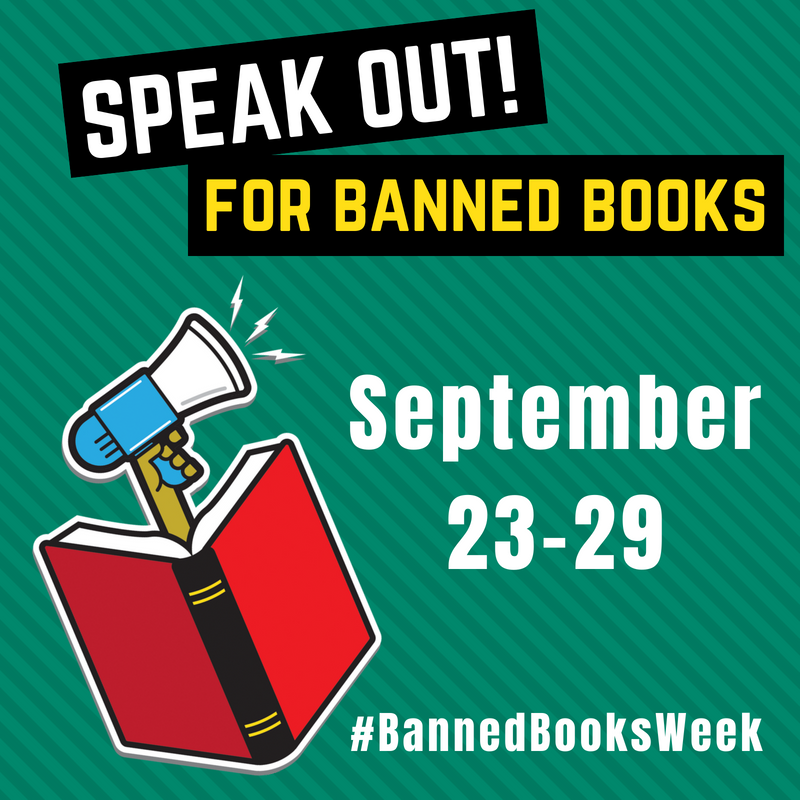 Since the inception of Banned Books Week in 1982, libraries and bookstores throughout the country have hosted local read-outs, continuous readings of banned and challenged books. Banned authors such as Judy Blume, Stephen Chbosky and Chris Crutcher have participated. Readers can join the tradition by posting a video of themselves reading from a banned book or talking about censorship. Links to read-out videos on YouTube can be submitted to be featured on the Banned Books Week YouTube channel. Lists of banned and challenged books can be found at ala.org/bbooks. How have authors used their words to speak out? What's the difference between being a voice of and for a movement? What will it take for America to be censorship free in both oral and written word? In the free webinar “Speak Out: Voicing Movements in the Face of Censorship,” authors will engage in a conversation about writing, activism and speaking out. Featured speakers include Brandy Colbert (“Little & Lion”), Alex Gino (“George”) and Marni Brown (“Gendered Lives, Sexual Beings: A Feminist Anthology”). The webinar is sponsored by the ALA’s Office for Intellectual Freedom, SAGE Publishing and Index on Censorship. Join us at 1:30 p.m. Central on Tuesday, Sept. 25. Learn more and reserve your spot. First celebrated in 1982, Banned Books Week brings together the entire book community in shared support of the freedom to seek and to express ideas. Every year, libraries, bookstores, universities and organizations host engaging programs and create eye-catching displays. The books featured during Banned Books Week have all been targeted with removal or restricted in libraries and schools. By focusing on efforts across the country to remove or restrict access to books, Banned Books Week draws national attention to the harms of censorship and the benefits of unrestricted reading. Find downloadable images, activities, and ways to get involved at ala.org/bbooks.